Even after all of the modern "revisions" of the Bible that are now available to Catholics, the Douay-Rheims version (the only Catholic English Bible in use for almost 400 years), is still the very best ever produced. This is a beautiful hardbound leather edition, which fills the great need for a small (6"x9") high quality Douay-Rheims Bible. It is a perfect gift for Christmas, First Communions, Confirmations, weddings, birthdays, etc., and is also great for those who want a portable Bible which is legible, durable, and handsome. •Gold and red satin ribbon page markers. THE GREAT SCRIPTURE COMMENTARY OF FR. CORNELIUS A LAPIDE, S.J. With this new edition, the full genius of Jesuit Fr. Cornelius a Lapide is available in English for the first time. Over the last 400 years this has been the most complete commentary in use by the Catholic Church, known for successfully combining piety and practicality. His age was that of the Counter Reformation, so Fr. a Lapide included plenty of apologetics. His vast scholarship is equaled, however, by his piety, giving freshness and power to his commentary which lacks in others. He was so known for his zealous holiness that he was buried in a separate place in order to find him more easily when eventually, it was hoped, he would be beatified. He is responsible for receiving St. John Ogilvie (hanged in 1615) into the Church and for administering Extreme Unction to St. John Berchmans. For nearly thirty years I suffer with and for Thee with gladness the continual martyrdom of religious life, the martyrdom of illness, the martyrdom of study and writing. Obtain for me also, I beseech Thee, to crown all, the fourth martyrdom of blood. For Thee I have spent my vital and animal spirits. I will spend my blood, too. This is a line-by-line reading of all the Gospels, applying history and the richness of the Church Fathers, with from a half-page to two pages of commentary for each line. A Catholic powerhouse. It is known to have made converts. Fr. Cornelius de Lapide, as praiseworthy for his piety as for his profound erudition, having been commissioned by several bishops and theologians to examine this devotion, did so with great thoroughness and deliberation, and praised it in a manner which we might nave expected from his well-known piety; and many other distinguished persons have followed his example? [St. Louis Mary de Montfort in his True Devotion to Mary]. • Used heavily by St. Gaspar Bertoni, founder of the Stigmatine Fathers and Biblical scholar. • Favorite of St. Anthony Mary Claret, great missionary to Cuba, founder of the Claretian Fathers. • Utilized by St. Robert Bellarmine, Doctor of the Church and Patron Saint of Catechists. • Praised by Dom Gueranger, author of The Liturgical Year, who made available to the faithful the treasures of the Missal as had Fr. a Lapide made available the treasures of Scripture. • Preferred by Fr. Denis Fahey, the greatest expositor of the Church's social doctrine in the English language. • An essential library selection of priests for sermon-writing, catechism classes, and convert instructions. • Well within the grasp of laypeople desiring to study the traditional Catholic interpretation of the Gospels. • Understand symbolism, cultural accents, mystical and allegorical meanings, and historical context. Know God in order to love God in order to serve God. 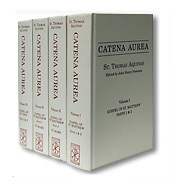 • Material for substantive and picturesque meditations for laypeople, especially Third Order members and resolute Ignatian retreatants. • Heirloom look and feel. Indestructible sewn bindings. Red leather, gold-embossed, 6" x 9" hardcover with satin ribbon. • Almost 3,000 pages in four volumes. A Catholic family's greatest Scripture resource. 2,900pp. 4 leather-bound hardcover volumes. Douay-Rheims Bible with a Black Leather-Soft Cover. still the best and safest version of the Bible in English. for study as well as meditation. black leather-soft cover, with gold edges and a ribbon marker and is packaged in an eye catching presentation box. 324pp., 324pp., 6" x 9", soft leather cover. Douay-Rheims Bible with a Burgundy Leather-Soft Cover. burgundy leather-soft cover, with gold edges and a ribbon marker and is packaged in an eye catching presentation box. 324pp., 6" x 9", soft leather cover. 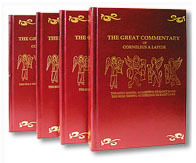 A truly unique edition of the New Testament in Latin (Clementine Vulgate) and English (Rheims). Suitable for students of theology and Scripture, for those studying Latin, or for any Catholic who wishes to study the Word of God in the language of Holy Mother Church. This edition brings together two classic versions of the Bible which have served Catholics well, down through the centuries. Newly typeset, crystal clear readability with the English and Latin side by side in columns for easy comparison. 546pp, 9" x 10", gold-embossed bonded leather hardcover, one ribbon. A great introductory Bible study that shows that the early Church was the Catholic Church and that the Bible is a Catholic book. Received recommendations from 14 bishops when first published and went through at least 16 editions. This commentary is not for scholars, but rather for the "ordinary" Catholic. It hands on to new generations the classic Scriptural teachings on faith and morals - from both Old Testament and New Testament - in a manner that is easy to understand. A typical chapter will first tell the Bible story, based on the Douay-Rheims Bible, with many fascinating explanations of particular words and phrases. Then follow many brief explanations of topics in the Scripture passage, showing clearly the Catholic doctrines that are contained there. These include teachings on the Church, the Mass, the Sacraments - especially the Holy Eucharist - Sanctifying Grace, intercessory prayer, Mortal Sin and Venial Sin, Forgiveness, the Will of God, Heaven, Hell, Purgatory, the Sacred Heart of Jesus, and much more. Finally, a brief "application" to daily life is given in each chapter. (Some of these are aimed at youth, yet overall they apply to everyone.) Every Catholic family, every classroom, every home school, every catechist and every priest should have a well - used copy of A Practical Commentary on Holy Scripture. 844 pp, softcover, Includes a special 30 page index. This edition of the New Testament is small enough (and sturdy enough) to hold up even when it's tucked into a crowded pocket or purse! As such, it's perfect to carry with you for those moments in line or in waiting rooms when you can take some time for a moment's consolation from the Word of God. A reprint of the reliable Confraternity edition published in 1941, the type in this pocket - size volume is large enough to read with ease. This edition also features a convenient ribbon placemarker. 701 pp. Leatherette cover. Which Bible Should You Read? is a short, provocative analysis showing which is the most accurate, safest English translation of the Bible. Not so surprisingly, the Douay-Rheims traditional Catholic version of the Bible emerges from this analysis and comparison as the best, safest, most accurate Bible in English of the ten versions compared.